18-inch x 18-inch Gunmetal Hobnail Indoor/Outdoor Carpet Tile (36 sq. 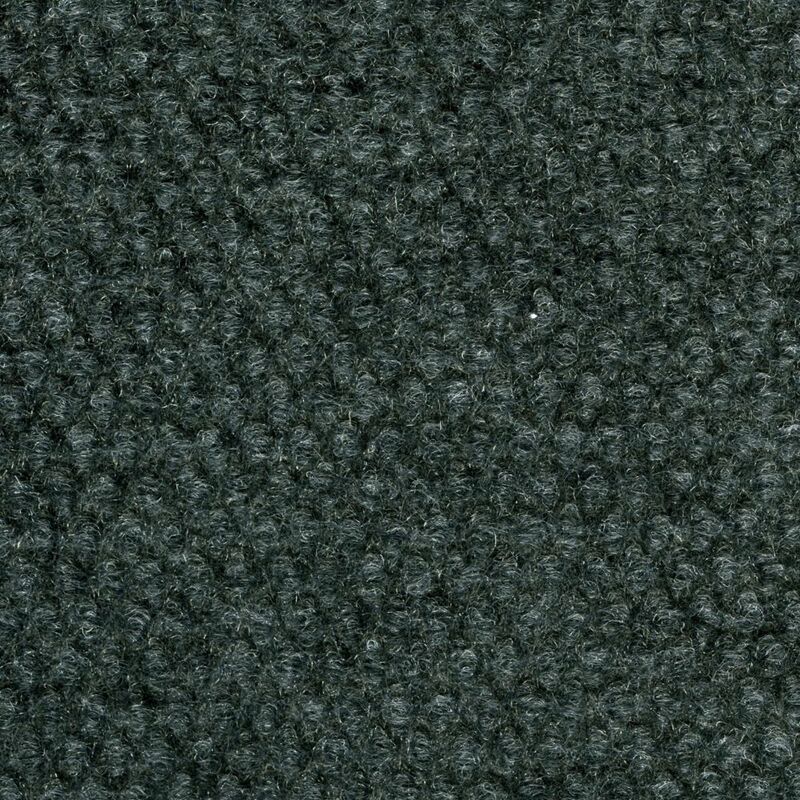 ft. / Case) The carpet tiles are the best choice if you want a fashion forward, textured look at a great price for your home. Used as an area rug, hallway runner or wall to wall, this tile provides a solution that does not require an installer or a separate adhesive. You can create a new look in an afternoon with this peel & stick system. The 18 in. x18 in. tiles are cut with the "perfect cut" system, which ensures easy installation for a beautiful floor. The only tools you will need to install are a measuring tape, chalk line, utility knife with a sharp blade and a contractor square. Easily maintained by vacuuming or sweeping. In the event of a stubborn stain or damaged tile, simply replace the tile with a new one. This lightweight, low profile, unpadded tile can be used in basements, porches, exercise rooms, workrooms, and even outdoors. 18-inch x 18-inch Gunmetal Hobnail Indoor/Outdoor Carpet Tile (36 sq. ft. / Case) is rated 4.0 out of 5 by 24. Rated 4 out of 5 by Ronn from Carpet tile Very easy to install. Covers the odd imperfection on the concrete floor in the basement. Used rubber cement to stick down the odd corner that didn’t want to stay in place. Rated 5 out of 5 by Johnny from Awesome Low Price Carpet Tile I bounced back and forth between this particular tile and the lower priced TrafficMASTER Ribbed model at .99 a sq ft. I ordered both of them to compare their durability and feel, seeing if it was worth the extra amount. In my opinion, it is. The other model had a texture that seemed to me like felt. I ordered them both in the "gunmetal" color. I uploaded a few pictures showing the texture difference between the two different tiles; hopefully it will answer questions to those who might have the same questions as me before I purchased them. This tile has a good sturdy feel to it for its price. I'm using it in my basement for my workout and music area and they are holding up very well. I'll be ordering more to finish the rest of my basement with it; they look and feel great! Rated 3 out of 5 by Teri from Like the look of the tile, delivery was an issue and the tile needed carpet tape added for extra stay power Carpet looks great, I put it over painted concrete in a warehouse. I decided to add some carpet tape to help it stick better. Glad I did, it was not very sticky without it. Rated 4 out of 5 by HomeDepotCustomer from replacement carpet the tiles /squares are very true in size and demisions the arrows were a help in keeping the pattern on line they cut well and the overall look is what we wanted . in all this job went down easy it only took a long time one day due to my age and health. walking on the floor with bare feet is good and the seams were very easy ti fit and flatten. I would use this product again we used this carpet squres in a high traffic breezeway laundry room. Rated 5 out of 5 by sal320 from Great for Closet Floors Installed for closet floors - easy and quick. They won't get much traffic - was simply looking for something to cover up ancient linoleum. They did the job perfectly. Make sure you are using a good carpet knife with fresh blades so you can get clean cuts. Rated 5 out of 5 by Anonymous from Easy to work with I installed this in my garage in an afternoon while having a garage sale. My husband made the chalk line and it was a piece of cake after that. Really happy with the look. I have a big room 20 x 20 I guess a games room is what you would call it. Sounds like a cheap fix and good look. I went to home depot to feel this product but they didn't have many. Just 2. I would like to order on line because of your sale but how soft is the tile and is it sturdy ??? Sorry for the delayed response. This TraficMaster tile is a great option for a recreational space. It is soft to the touch and durable. Also, the tiles can be easily replaced one at a time if needed. Thank you for your question.